16 | TH E M R EP O RT FEATURE required for it. Once the com- pany has a match of skill sets, the recruitment team sets up the interview. "At this point, we are able to explore the cultural fit rather than job fit," explained Jeff Hutchins, Chief People Officer, Finicity. "We love new ideas that address mar- ket opportunities and challenges. And once we have one, we move fast to develop it. But we're also very family oriented and always look to have fun. We try to fully expose our culture to candidates so they can make their own as- sessment. We truly believe it's a two-way interview, and it must be a fit for both of us." Being open about what the company is and what it isn't is also helping organizations pick the right person suitable for the job. This includes communicating transparently throughout the hir- ing process, setting clear expecta- tions from the candidates, and really listening to what they ex- pect from the company, whether it is a big or a small organization. "We're open about what MiMutual Mortgage is and what it is not. This allows both the candidate and the company to ef- fectively evaluate the long-term fit with each other. After all, forcing a square peg into a round hole never works out well in the long term," said Daniel Jacobs, EVP, National Retail Lending at MiMutual Mortgage, while explaining that communication that always ensured all parties involved knew what to expect next, when to expect it, and what was required of them was the "secret sauce" of the company's hiring team. A two-way process doesn't just include getting the right hires, but also looks beyond the conven- tional to get the right ones. One such program developed and pro- moted by Black Knight to get the right fit is a summer internship program in which students from colleges and universities across the country learn firsthand about the variety of roles and responsi- bilities at the software, data, and analytics provider over the sum- mer holidays. "As valued team members, our interns work side- by-side with full-time employees performing meaningful project tasks that directly impact our day-to-day business," said Melissa Circelli, Chief Human Resources Executive, Black Knight. "From the start, interns are challenged to demonstrate their strengths and apply their knowledge to help Black Knight achieve its business strategy. Once they graduate from college, many of Black Knight's interns are hired for full-time positions at the company." These Perks Work I f the path to retaining great talent begins with the right hiring process, a robust employee- engagement program serves to strengthen it. It ranges from such must-have benefits as competitive compensation, a 401(k) program, and medical insurance to perks like discounted event tickets and employee loan programs. At Carrington Mortgage Services, the former is a popular program that allows employees a shot at owning their dream home. 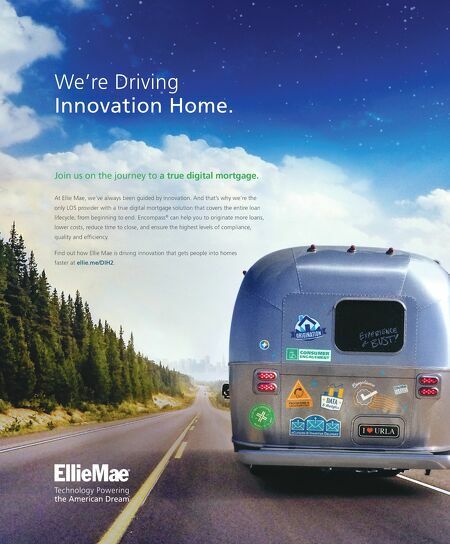 The program includes waivers for pro- cessing and/or underwriting fees and a quarter-point discount on their mortgage rate once an em- ployee qualifies for a Carrington home-loan program. "Spouses and domestic partners are also eligible for this ben- efit," said Rick Sharga, EVP, Carrington Mortgage Holdings. "Other offers include $1,000 off closing costs for qualified fam- ily members of Associates. And eligible Carrington Associates receive a $500 referral bonus for each referred family member or friend whose loan funds." Sharga said that Carrington also offers employees a diverse range of benefits, including access to legal services, comprehensive health and wellness services, discounts on entertainment and gym member- ships, as well as savings on appli- ances and wireless services. Having existing employees chip in to make the new ones feel comfortable not only engages the new hires but also allows exist- ing employees to lead by setting a good example. RCN Capital employs this method as an important aspect of its onboard- ing process. Apart from that, the management frequently seeks inputs from employees to ensure decisions are made that keep their best interests in mind. "Employees are involved in numerous parts of the decision-making process within the company," said Jeffrey Tesch, Managing Director, RCN Capital. "Annual goals are estab- lished to create a team environ- ment where all employees come together to work together to a common goal." Mortgage Contracting Services (MCS), offers its employees flex- time that allows them to choose a work schedule that best fits their life. Full-time employees can arrive at the office anytime between the hours of 7:00 a.m. and 8:30 a.m., allowing departure times between 4:00 p.m. and 5:30 p.m. "We continue to get rave reviews on flex-scheduling, as it allows our employees to more personally define their work hours – en- abling them to maximize their personal time," said Marti Diaz, SVP, Human Resources at MCS. "We've also had many employees share that this flex-time schedule allows them significant savings on childcare because it provides them with more options around pick-up/ drop-off times for their children." Creating 'Giver' Cultures I n an article for McKinsely, Adam Grant the author of the book Give and Take: A Revolution- ary Approach to Success, makes a case for why some of the great- est companies have what he calls a "giver culture." According to Grant, in giver cultures, "employees operate as the high-performing intelligence Companies are fast waking up to the power of recognition in retaining employees. 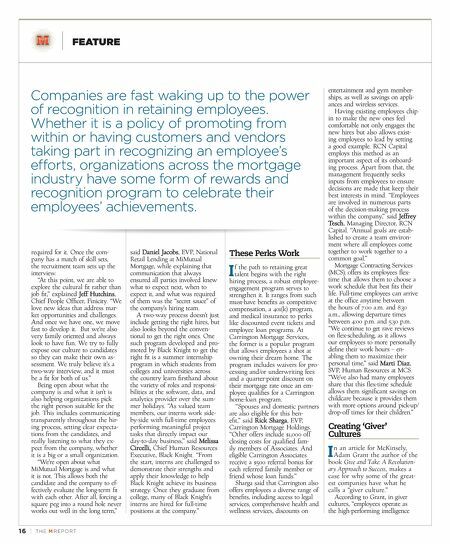 Whether it is a policy of promoting from within or having customers and vendors taking part in recognizing an employee's efforts, organizations across the mortgage industry have some form of rewards and recognition program to celebrate their employees' achievements.